The courtyard garden of verdant vegetables at Poste Moderne Brasserie in DC. It was a dizzying week because the food world in the capital area has exploded. Farm to fork restaurants are sourcing from a myriad of new and vibrant farmers markets, rooftop gardens are supplying veggies to restaurants across the street – fed by compost from the very restaurants, and the USDA not only hosts a farmers market onsite – they shared the locations of all markets nationwide. I began the week talking to Amanda Eamich, Director of New Media at the USDA. Eamich was able to highlight and share several of the tools the USDA has provided to help inform policy and the public. The Economic Research Service (ERS) section of the USDA has built two amazing online tools to help pinpoint food availability and broader “determinants of food choices and diet quality.” The Food Desert Locator shows all areas in the country that are more than 1 kilometer from a source of healthy food – you might be surprised at certain locations. The Food Environment Atlas enables you to view on a map a plethora of food choice determinants. Factors such as the 2008 sales tax from soda vending machines, the 2009 low-income preschool obesity rate, or the 2006 relative price ratio of green-leafy veggies to starchy veggies each jostle for your attention in this captivating tool. 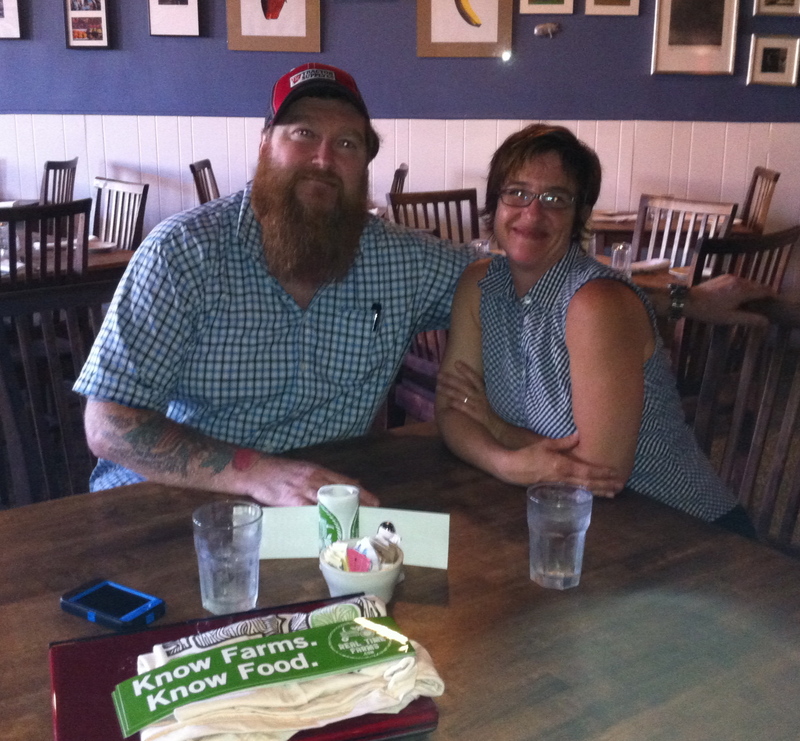 Chef Winston Blick and Cristin Dadant at Clementine in Baltimore. The next four days were a whirlwind of visiting restaurants in DC and Baltimore. 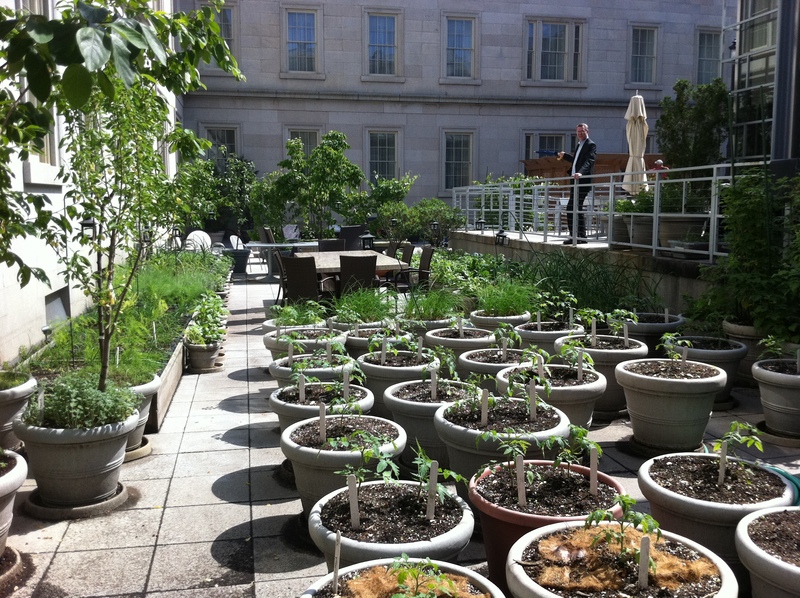 Chef Rob Weland of Poste Moderne Brasserie showed me his courtyard garden in the Hotel Monaco – where you are literally eating next to a tomato plant growing in a pot. Chef Spike Gjerd of Woodberry Kitchen gave me a tour of his kitchens, including the sausage aging room (all butchered and made in house, naturally) and the wall of in house preserves (the last of the 2000 pounds of tomatoes from 2010 and the first jars of 2011 ramps in evidence). Chef Winston Blick of Clementine spoke of providing compost to Hamilton Crop Circle – a rooftop garden across the street – that, in turn, returns vegetables to his customers. I met with Nic Jammet, one of the founders of Sweetgreen, a sustainable build your own salad/yogurt phenomena that has rocketed to ten locations in the last 3 ½ years. I look forward to attending their Sweetlife Festival next May. Penn Quarter FRESHFARM Market closes off 8th street just north of the National Archive Building that holds the Constitution, freedom of assembly in action! When not gawking at menus I was able to visit two farmers markets in the middle of town – and I mean in the middle of town. One is 3 blocks from the Mall and the other is 3 blocks from the White House – producer only, crowded, and diverse (orchids, wood fired pizza, and the first strawberries of the season – glorious). 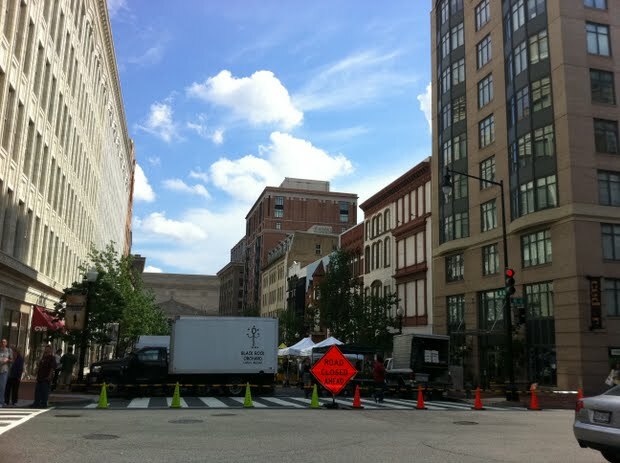 Thank you FRESHFARM for your great work creating pedestrian villages in downtown DC. My last day started with a meeting with Debra Tropp and her team of committed farmers market devotees in the Farmers Market and Direct Marketing Research Division of the USDA. Food Tech Connect recently posted a great article describing the need and uses for the Farmers Market Directory in a conversation with Tropp. As a former farmers’ market manager, I remember last year feeling honored and vindicated to fill out the survey to populate the directory. I was doing something important when the government asked me the number of people who came to the market or whether we accepted Bridge Cards – my little stretch of pavement 18 weeks of the year became part of something large and meaningful. 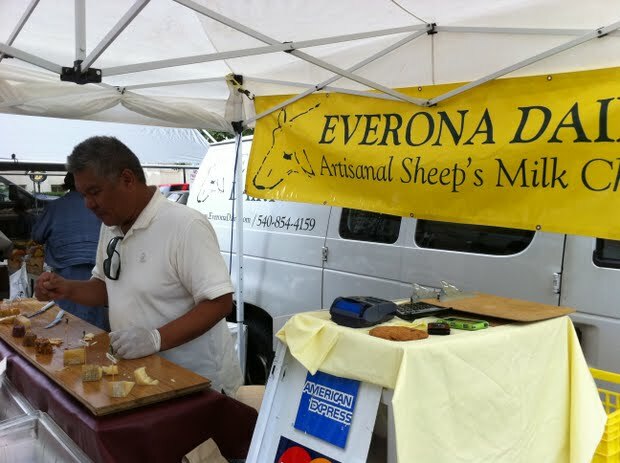 Everona Dairy won the best farmhouse cheese for their Piedmont cheese in 2005. The cherry on my Sundae week was meeting with Gretchen Hoffman of the American Farmland Trust – the vanguard group who worked in the 1980s to create and implement conservation easements for farmland. A few years ago, Hoffman spearheaded the America’s Favorite Farmers Market Contest, voting starts June 1st! A week of good food, good company, and good learnings – what more could one want? This entry was posted in At the Market (farmers market) and tagged America's Favorite Farmers Market Contest, Baltimore, Corinna Borden, DC, Farmers Market Directory, Food Desert Locator, Food Environment Atlas, FRESHFARM markets, Let's Move, Real Time Farms, USDA. Bookmark the permalink.